I love the little town in which I’ve lived for over four years now. One of the things I love most about it is its support of the arts. We have a remarkable collection of public art lining our main street, as well as an “Alley Art” program, in which artists paint amazing murals on residents’ alley-facing garage doors. As I am planning on moving in with MKL (because we think a husband and wife should live together) in his town some 40 miles away, I wanted to document our small-town art so I could share it here, with a larger audience. Two weekends ago, on a gorgeous Sunday afternoon, I took a long walk and began to capture some images. I’ll let you see them as we move along in time together. This beautiful piece is called Waiting for the Bus by artist Lucas Loeffler Child. The artist’s mother became ill with pancreatic cancer and quickly passed away just as Child was finishing the piece. 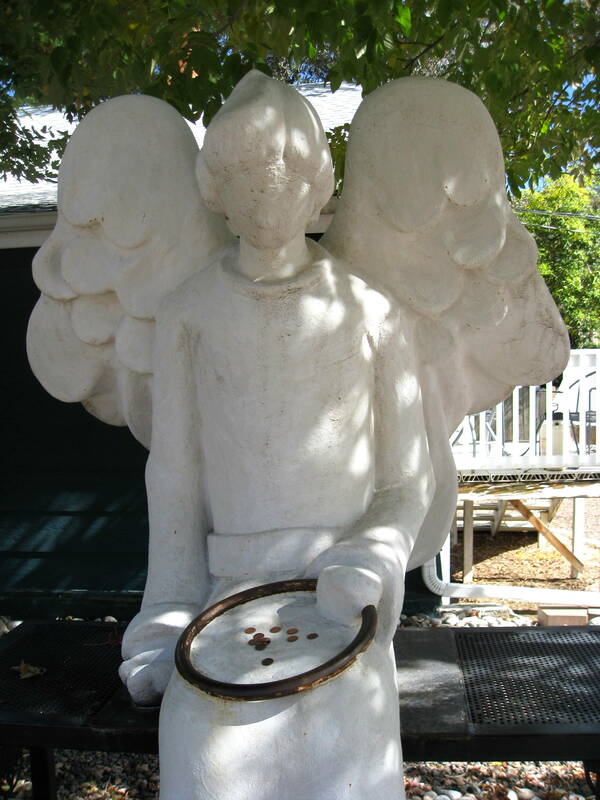 He gathered a collection of little things – pennies from the year she was born and the year she died, little treasures that the two of them shared, memories – and put them in a shining circular tin, placing it inside the chest of the angel just where the heart would be. He also positioned her in the center of her bench, so that people could sit on either side of her, with one of her hands curled gently beside her, so someone could hold it for comfort. 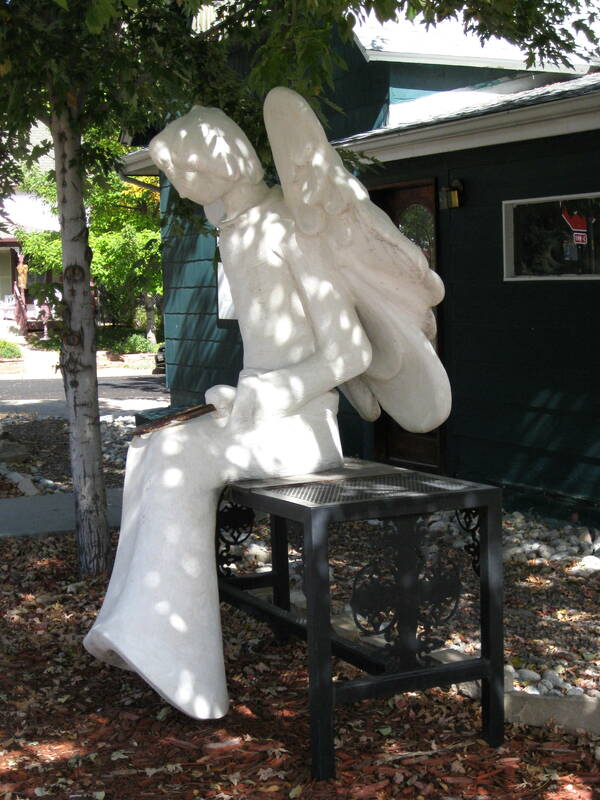 While much of our town’s art changes from year to year, our angel is permanent, sitting waiting for the bus in the shade, halo in her lap, at the end of a very long day. On our Labor Day outing, Kelsea and I accidentally passed this unique statue and made a U-turn for closer inspection. 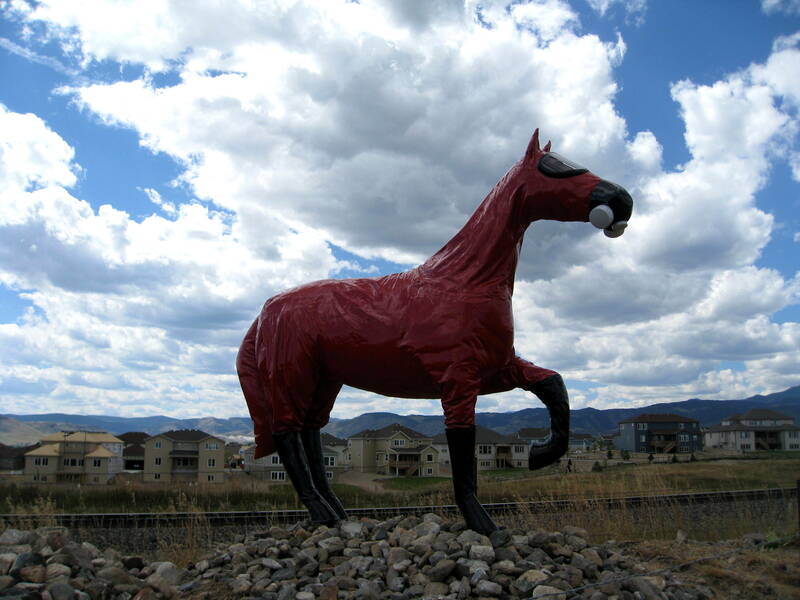 This is the Rocky Flats Memorial called the Cold War Horse. Please note the radiation-protection suit, rubber boots, and gas mask. The dedication is slated for October 18th. For those of you unfamiliar with it, Rocky Flats was a nuclear weapons production facility that closed in the 1990s. During the 1980s after I moved here, I recall seeing protestors outside the gates every time I drove by on Highway 93 (a small, pretty highway between Boulder and Golden that is so dangerous that there were bumper stickers saying “Pray for me, I drive 93”). There was also much wrongdoing in the facility; it violated numerous environmental laws and the Department of Energy said that the plant’s ground water was “the single greatest environmental hazard at any of its nuclear facilities.” (according to the Google). In the last decade, the space became the Rocky Flats Wildlife Refuge – but the clean-up only required that the cleaner-uppers clean-up the first three feet of soil, so I always expected to see glowing, three-headed, 20-foot tall elk with trees for antlers crossing Indiana Street. Now, though, something else has changed, and apparently memories and agreements are short, because they are putting up hundreds of homes on this property that used to be so contaminated. I honestly didn’t think that plutonium contamination resolved itself so quickly, but who am I to say? But back to the memorial…or perhaps not, because when I tried to take MKL by it last weekend, it had vanished. 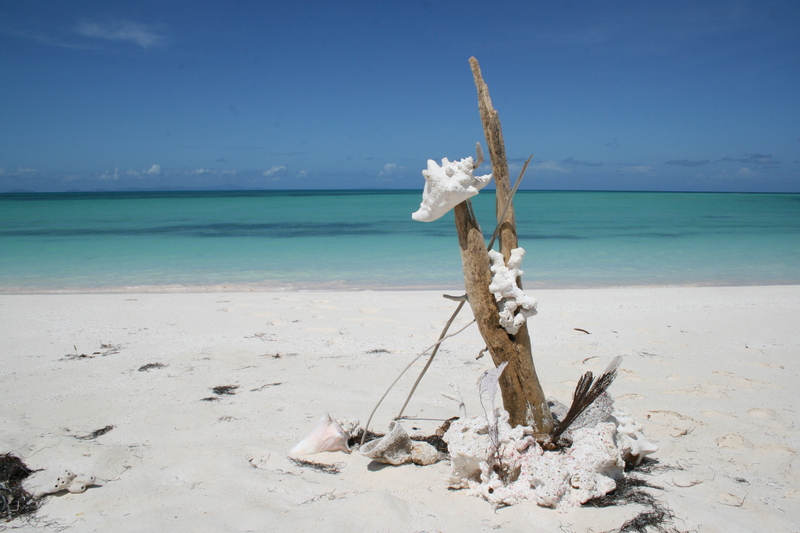 VANISHED! I am puzzled and plan to make a trip back down the road to see if I just missed it (not likely!) or….? My little town is an art town. We have sculptures lining our Main Street, and a program called Alley Art, in which you can have a mural painted on your alley-facing garage door. Murals are also found on the sides of buildings “downtown”, and I’ve had all good intentions of going on a few walkabouts at different times of day to capture images to share here. 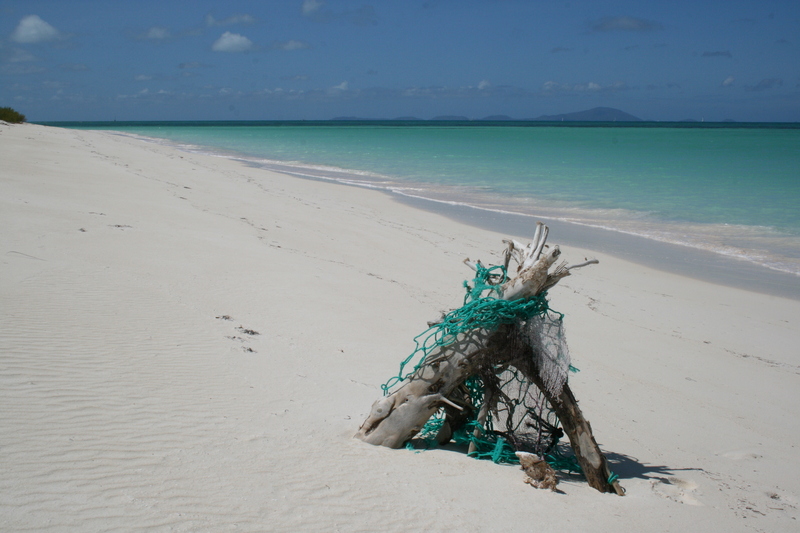 But we start where we start, don’t we? This is the first piece of art one sees as one heads into town coming South on the highway. 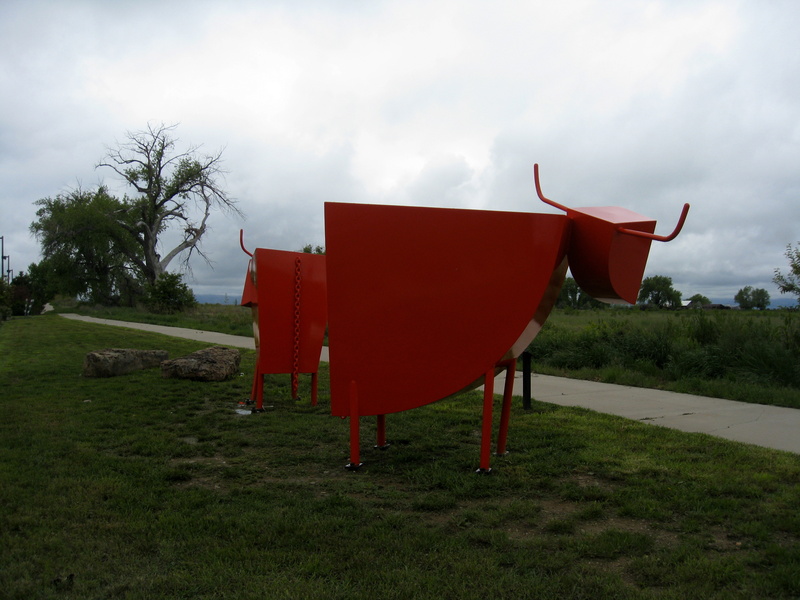 It’s next to a bike path – and to WalMart, but we’ll forgive these two cheerful metal cows for that.